The recent alleged death-threat made to a dog walker by a speeding cyclist along the Basingstoke Canal in Woking once again highlights the difficulties that continue to arise with the use of the restricted shared space by canals in the UK. It was the view of the Society that, once 8 or more miles of towpath were upgraded a few years ago by Cycle Woking, conflicts between cyclists and other users were likely to rise. Signs were installed along the Saturn Trail (as the towpath is called) that give distances between locations in minutes, assuming a cycling speed of 9 mph. We believe these exacerbated the problem as they might have encouraged speeding (as well as being of little use to walkers and also unsuited to a historical canal environment), and campaigned to have these signs removed, which has now been done. In response to increasing numbers of reports of user conflict on the canal towpath particularly through Woking, the Basingstoke Canal Authority approached the Canal & River Trust last year to gain permission to role out their successful shared use campaign. This initiative is intended to promote better shared use of towpaths. Although different user groups have access to the towpath, pedestrians have right of way. It’s about ensuring everyone slows down and shows consideration to other users. BCA Staff and volunteer Canal Society lengthsmen are driving forward the promotion and have spent several busy days on the Basingstoke Canal towpath advertising this campaign called ‘share the space, drop the pace’. These campaign days involve chatting to all towpath users and handing out free merchandise and campaign leaflets to promote positive shared use. There were many positive comments from passers-by for what was going on. So far they have been held at Bedser Bridge in Woking (left and below), Kiln Bridge in St Johns and the Canal Centre at Mytchett, with others planned. The canal towpath regularly sees large numbers of towpath users particularly through the busier urban areas of Woking, St Johns, Ash, Aldershot and Fleet. While it is fantastic to see the space so well used for commuting and leisure, the space that everyone shares is very narrow and everyone is responsible for their impact on this space and others users. The project has been funded by £22,000 from the Local Sustainable Transport Fund and will also include a package of new map information panels and directional signage through the Woking area of the canal. Watch out for these in the near future. A launch event was held in May on the World Wildlife Fund building patio for local councillors, including the Mayor of Woking as well as user group representatives. Surrey County Council Chairman, David Munro says “it was so good to share our optimism and happiness at the start of a thoroughly worthwhile campaign to make the towpath accessible to everyone who wants to use it – and that must mean hundreds of thousands of people of varying mobility needs and abilities”. Further information on the Canal & River Trust campaign that rolled out in London can be found here. 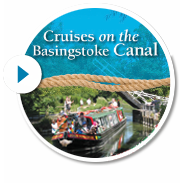 The Basingstoke Canal Authority have licenced permission from Canal & River Trust to use this campaign and its logo.